In contrast to many previously unproductive summits, the just concluded CIS Summit at the Turkmen capital Ashgabat promises to carry forward cooperation among the member counties to a new level. The summit decided to strengthen joint anti-terrorism training efforts and step up cooperation to combat illegal drug-trafficking, extremism and organised crime in the region. Agreements have been signed for cooperation to provide training to anti-terrorism specialists and set up a council of heads of the financial intelligence divisions of the Commonwealth of Independent States (CIS) member-states in order to coordinate joint actions against money laundering and financing of terrorist groups. These are obviously moves to face the situation that would emerge in the aftermath of the withdrawal of NATO troops from Afghanistan. Experts have predicted the worsening of the situation in Afghanistan following the pull out of NATO troops from that country in 2014 that is likely to lead to rise of non-traditional threats like terrorism, Islamic fundamentalism, separatism and drug-trafficking in the region. 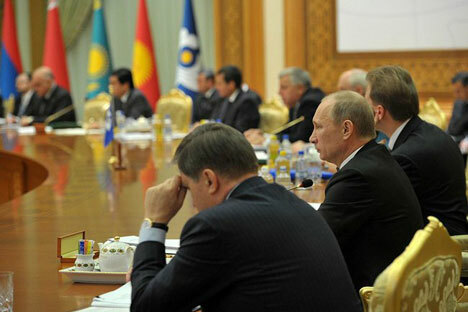 The Ashgabat summit assumes importance for its progress in the sphere of economic cooperation among CIS member-states. In this context, President Putin addressing the summit stressed that economic cooperation within the CIS has been the most important part of its work. It is especially relevant today as the global economic crisis still continues and in some cases getting more aggravated. President Putin further emphasised that the agreement on a free-trade zone within the CIS creates new opportunities for fighting the crisis and building up mutual business ties. Most of the CIS countries with the exception of Kyrgyzstan and Tajikistan have signed and ratified the free-trade zone agreement, and Uzbekistan has expressed its desire to join the CIS free-trade zone. Preparations have started for drafting an agreement for free trade in services on the initiative of Ukraine. These steps would bring real benefits for all participating countries and provide an impetus to strengthening effective economic relations. Yet another major step that would reinforce economic integration in the CIS zone is the agreement on building a common currency market in the post-Soviet space. The agreement designed to make use of national currencies in carrying out commercial transactions and to help the banks of CIS countries make their functioning more effective would promote macro-economic stability in the region. This step would no doubt accelerate the integration process in the CIS region by strengthening the Customs Union and Common Economic Space - Moscow’s two pet projects towards building Eurasian Economic Union by January 1, 2015. The agreement aims at cutting the use of US dollar and Euro and facilitates transaction in national currencies. It would above all promote the use of the Russian Rouble as a reserve currency given the pre-dominant position of Russian economy in the former Soviet space. Russian President Vladimir Putin, welcoming all states that wish to join the above integration projects, has hailed the move as another step towards building stronger economic ties among former Soviet republics. The Customs Union consisting of Russia, Belarus and Kazakhstan was built in 2011 has brought significant dividends to its members, and the Common Economic space kick–started from January 1, 2012 is gaining momentum. Kyrgyzstan and Tajikistan are all set to join the Customs Union very soon. Proposing to augment high tech-cooperation among CIS members, President Putin in the summit urged to use Russia-made GLONASS satellite navigation system that would offer significant economic benefits to the member states by reducing transportation costs in all forms of transport systems of the community and strengthen transport security. Russia, hoping that CIS states would take an active interest in the project, is ready to provide all help in building the system for the region. Stressing the importance of defense cooperation and interaction between law-enforcement and border security agencies of CIS counties, Putin noted that the implementation of plans in these directions will bolster the status of the community. Out of the 12 countries forming the CIS, Georgia left the organisation in 2008 in the aftermath of Russia-Georgia military conflict. The Ashgabat summit was attended by eight presidents while Azerbaijan and Moldova were represented by their Prime ministers and Kyrgyzstan by its minister of external affairs. Ukraine, a country vital for integration in the former Soviet space but known to shirk responsibility on key integration issues, was represented in the summit by its President Victor Yanukovich. The Ukrainian president, undecided and unsteady in choosing his country’s integration either with Russia-led Customs Union or the European union, was conspicuous by his statement at Ashgabat that Ukraine has to join some provisions of Customs Union, otherwise it would lose a lot in economic terms. Ukraine’s trade with the Customs Union is more than US$ 60 billion, which is more than its trade turnover with Europe. Estimates suggest that if Ukraine at all would be permitted to join the European integration process ignoring the Russia-led Customs Union, it would lose between $8-10 billion annually. The Commonwealth of Independent States, created in December 1991, was a loose association of former Soviet Republics and turned out largely to be a platform for the peaceful divorce of those states in the aftermath of Soviet disintegration. The toothless body under President Yeltsin has gathered some steam under President Putin’s leadership.